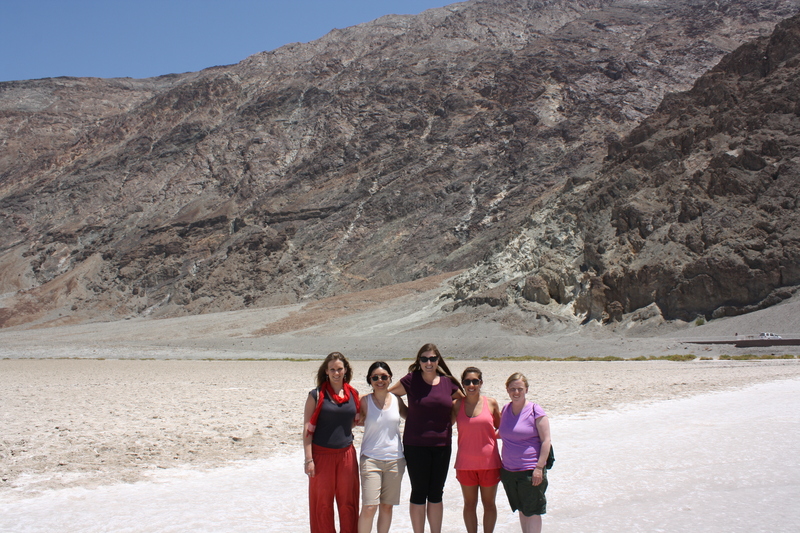 The other four interns and I arrived in Death Valley National Park on June 1 and began working two days later. We are sponsored by the Death Valley Natural History Association with proceeds from the Organ Concert and the gift shops at Scotty’s Castle and the Furnace Creek Visitor Center. The internship is five weeks long and we are currently finishing up our last week. I can’t believe it’s almost over! I am not ready to leave Death Valley just yet. Yes it is hot here. But it’s a dry heat, so it really is not that bad. I think I was fairly acclimated by the second or third day of living in Death Valley. This June was not as hot as it was last June (when it was about 120 degrees every day of the month)—we’re lucky. Although there is no wi-fi in the dorms where the interns are housed in Cow Creek, there are plenty of things to do. On our first day, our supervisor Chris Wonderly gave us a tour of the area. 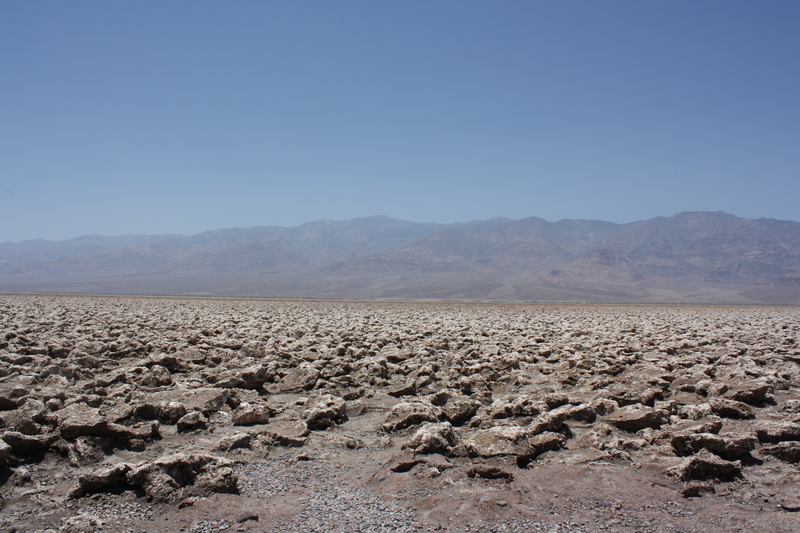 We went to Badwater Basin first, where the elevation is 282 feet below sea level. Next, he took us to Devil’s Golf Course, and then to Artist’s Palette. Artist’s Palette was my favorite. My fellow interns at Badwater Basin. From left: Tory, me, Raquel, Leslie, and Clare. 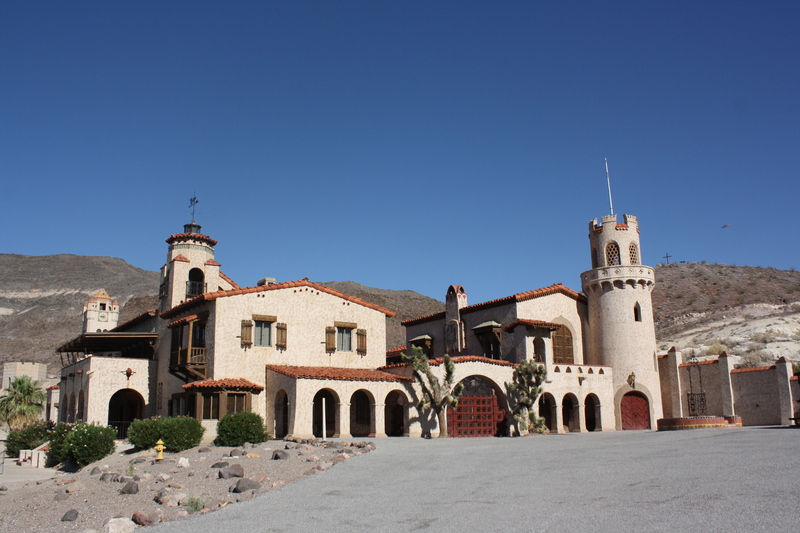 Although it is called Scotty’s Castle, this historic house was not owned by Scotty. It was funded by Albert Johnson, a millionaire businessman in Chicago, and was built in the 1920s. 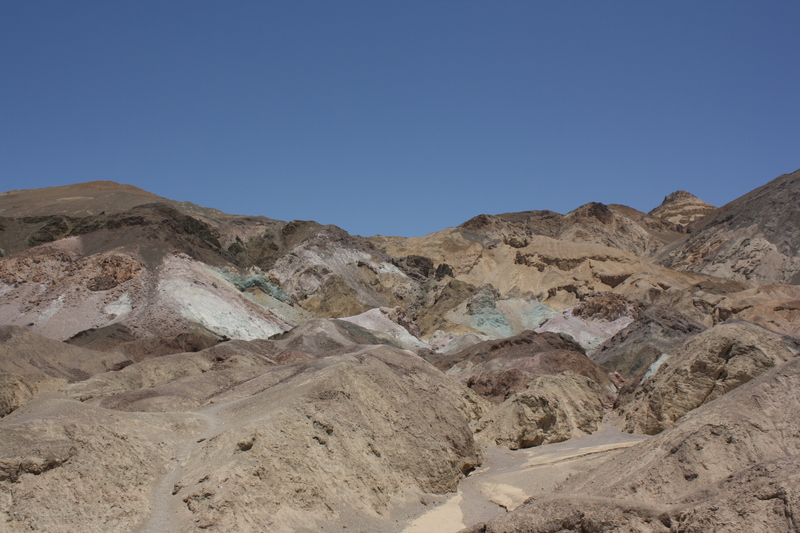 Scotty lured investors to Death Valley by telling them there was gold. Johnson made a trip out west to check out the gold mine, but it was soon apparent that there was no gold available. Instead of reacting angrily, Johnson became friends with Scotty, remained his financial backer for the rest of his life, and never asked for a penny from Scotty as Scotty had always repaid him with laughter. I had not heard of Death Valley Scotty before discovering this internship, but he was very famous in the early-to-mid 1900s. 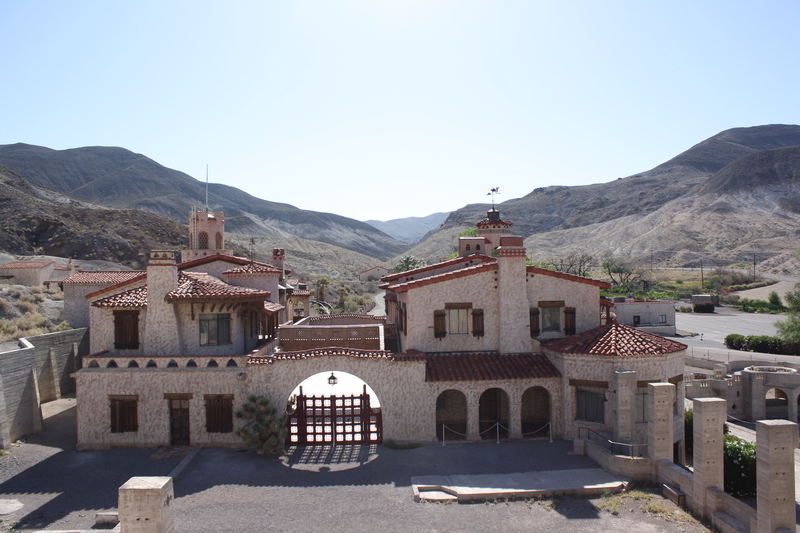 Find out more about Scotty’s Castle here: http://www.nps.gov/deva/historyculture/scottys-castle.htm. We’ve been cleaning the castle room by room, from ceiling to floor. Since I do not mind cleaning, this internship has been a lot of fun. A typical day is: move objects from the room to a padded and sheeted table elsewhere (usually where there is plenty of space to move around with a vacuum). Then sheet the tables or other objects that cannot be moved. We vacuum the ceilings and the walls using backpack vacuums with HEPA filters. The backpack vacuums only have one setting; we use those for the ceilings and walls because they are not (typically) fragile. All our vacuums have HEPA filters. Certain objects require a Nilfisk silver canister vacuum with variable suction control. We generally use goat-hair brushes on low suction for objects. Smaller or more delicate objects may require use of a soft, handheld artist’s brush to sweep the dust from objects into the vacuum. The curtains, carpets, and furniture also require use of a goat-hair brush on low suction; we dab the material or object lightly with the goat-hair brush to clean it. Raquel (left) and Gretchen Voeks, the curator at Scotty’s Castle (right), sheeting the bed in Scotty’s Bedroom to protect the bed from falling dust/dirt as the ceilings are vacuumed. I am vacuuming the ceiling of the Italian Room. Leslie is wiping the dust from the objects in the Dining Room with a dry cotton cloth. Clare is carefully vacuuming a chair in the Upper Music Room. We are rolling up the carpet evenly in the Upper Music Room. Tory and I risking life and limb to meticulously vacuum every inch of the imitation stucco in the Garage Alcove. And Chris is in the background, wearing a respirator (in case there are rodent droppings that may contain the hantavirus) and vacuuming as well. Leslie and Raquel wiping the dust/dirt from the 1933 Packard in the Garage Alcove. This past Friday, we spent a day learning about IPM (integrated pest management) from Lindsay. We paired off to retrieve the traps and set up new ones in their place. Tory and I got the ones from the Main House. Clare got the Annex, and Lindsay, Leslie, and Raquel got the Stables. Collecting the traps and replacing them was the easy part. Afterwards, we had to sort through them and write down which pests were in which trap by opening up each one and recording what we saw, e.g. three moths and two spiders. There was a variation of bugs/insects in these traps. The most common things we saw were spiders, moths, flies, ants, beetles, cockroaches, and/or silverfish. The other interns and I were also given the chance to be a leader for a day. 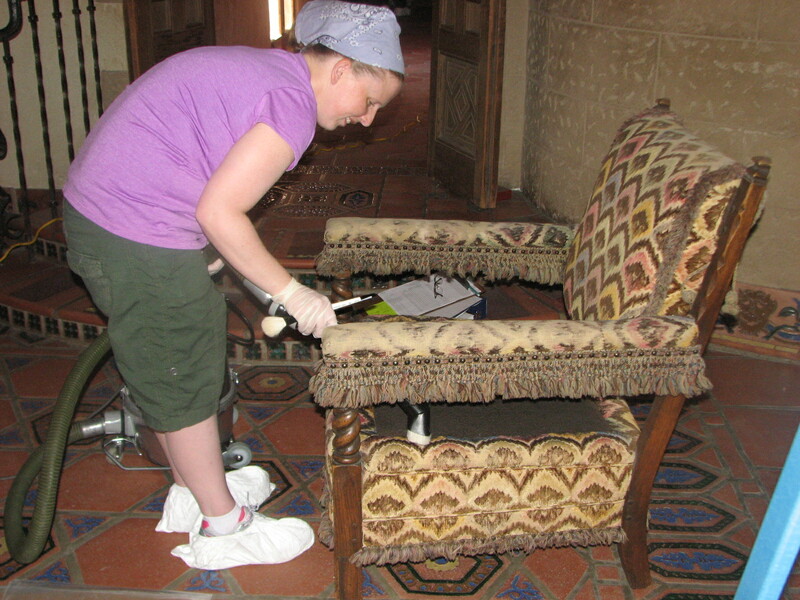 I got to be in charge on the day we cleaned the two guest rooms in the Annex, the American Room and the Bokhara Room. I directed what was to be done this day and in which order—it was very similar to how we’ve been cleaning each room throughout this experience. I could not have done this without the help of my peers. Overall, I believe the day went well; we finished what we set out to do. Although this internship is not focused on treatment conservation, cleaning is still one of the first steps in the conservation process (it was more about preventive conservation). 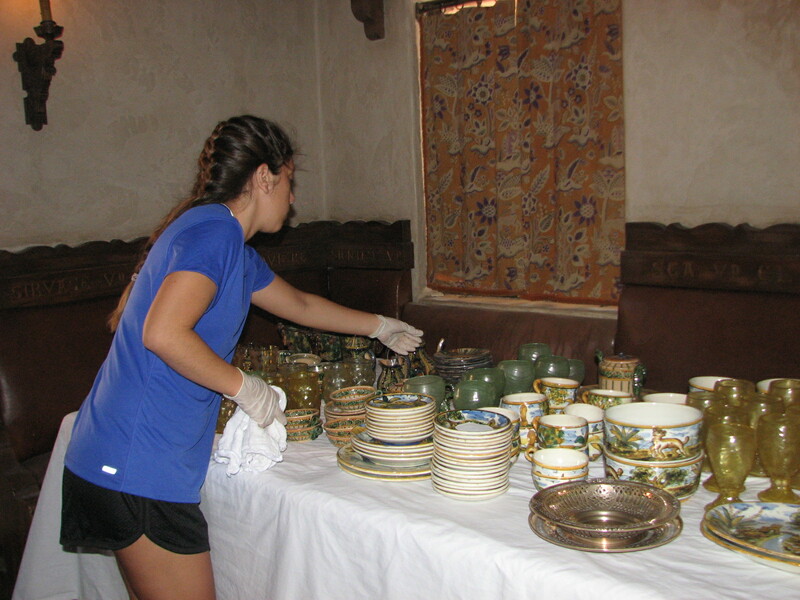 I have learned a lot about historic house museum practices; preservation maintenance: how to properly handle/clean historic objects and furnishings; and the valuable techniques and skills to have in a museum setting. My favorite part was being able to handle objects you would not normally be able to touch as a visitor. I love being in Death Valley, and so far this entire experience has been one I will not forget!